In 1967, Lloyd and Carol Linn welcomed two young Korean orphans into their Felton home through the process of international adoption. The experience was so wonderful that their daughter and son-in-law, Mary and Steve Hoff of Ben Lomond, also decided to adopt a Korean boy and then a Brazilian girl. 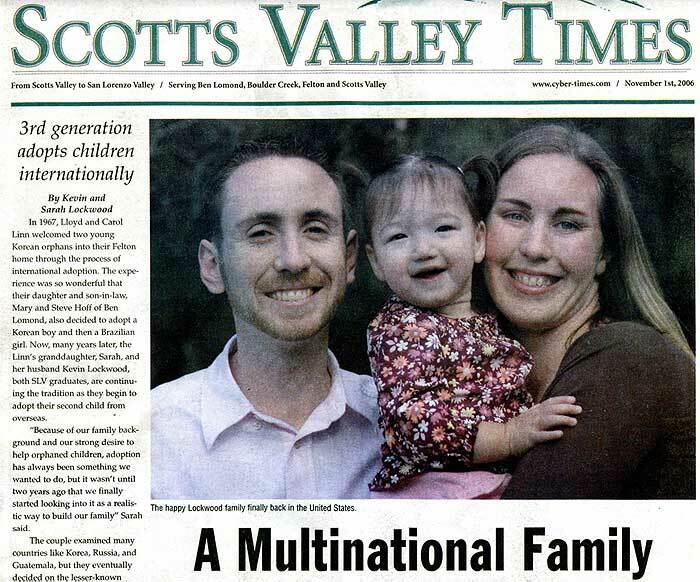 Now, many years later, the Linn’s granddaughter, Sarah, and her husband Kevin Lockwood, both SLV graduates, are continuing the tradition as they begin to adopt their second child from overseas. “Because of our family background and our strong desire to help orphaned children, adoption has always been something we wanted to do, but it wasn’t until two years ago that we finally started looking into it as a realistic way to build our family” Sarah said. The couple examined many countries like Korea, Russia, and Guatemala, but they eventually decided on the lesser-known country of Kazakhstan. “At first, we really didn’t feel led to any particular country, but then we began hearing about Kazakhstan. We were instantly attracted to the country, and moved by the large amount of its orphans who needed homes” Kevin recalled. After working for months to get the necessary paperwork, background checks and notarizations submitted, all the Lockwoods had left to do was wait. Finally, on April 15th, 2005, the long-awaited call came in; there was a child on the other side of the world waiting for a family. 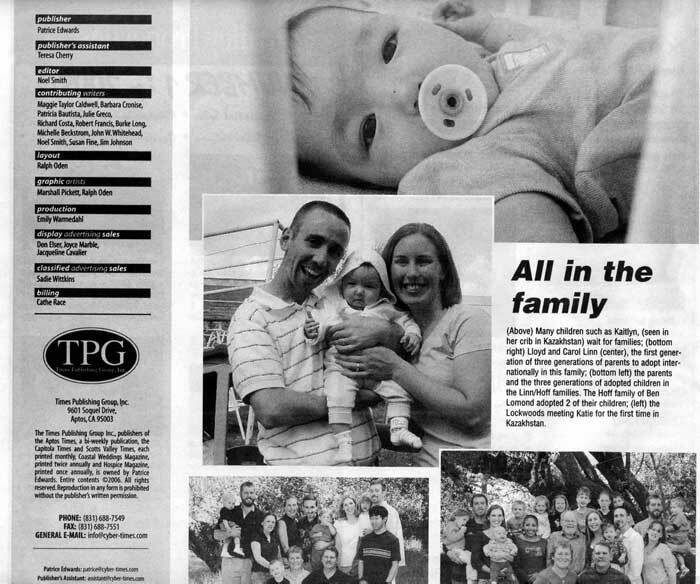 “It was one of the most exciting days for us; we finally knew the name of our child” Sarah said. The adoption announcement, called a referral, stated that a five month old baby girl was ready and waiting for the couple. In as little as one month, the Lockwoods were on-board a plane bound for Kazakhstan. Although the trip was filled with many unknowns, all they could think about was meeting their daughter for the first time. One of the unknowns on the Lockwoods mind was what it would be like to live in a foreign country for two months. A unique thing about Kazakhstan’s adoption process is that it requires would-be parents to stay in the country for an extended period of time while getting to know their child, attending court hearings, and processing all the necessary paperwork. “We were really worried about getting homesick after two months, but it turned out to be a wonderful opportunity to experience our daughter’s culture. Now we have so much to share with her when she gets older” Sarah recalled. Finally, after two full months overseas, the Lockwoods returned to California holding their new daughter, Kaitlyn Alueshka Lockwood. Since that day in July 2005, they have been overjoyed to watch their little girl grow. “We have been so blessed to have Katie as a part of our lives. Adopting her was such a miracle; we’re just so grateful to have a daughter” Sarah said. The craft boutique will be held on Thanksgiving weekend at the Zayante Fire House and will feature a variety of handmade gift and craft items donated by local artisans and crafters. There will also be a raffle for prizes, including a quilt, and free refreshments. The boutique will be open on Saturday, November 25th from 9am to 5pm and on Sunday, November 26th from 10am to 4pm. More information and sample items can be found on the website at www.TheLockwoodHome.com/Boutique. International adoption, although often viewed as a humanitarian effort, can be very expensive for the adoptive parents. Many non-profit organizations offer scholarships, grants and no-interest loans for those adopting, however these are often spread thin, leaving would-be parents searching for other ways to obtain the necessary funds. “We held many different fundraisers, including a number of garage sales, but what blessed us the most was our gift boutique” Kevin recalled. After successfully adopting Kaitlyn in 2005, Kevin and Sarah Lockwood are once again planning on adopting an overseas orphan, this time from Vietnam. To achieve this goal, they are preparing for their second Helping Hands Gift Boutique which will be held on Thanksgiving weekend at the Zayante Fire House. The boutique will once again feature handmade art and craft items, all of which have been donated by local residents. “We have been given some incredible items this year, including hand-painted silk scarfs, beaded jewelry, hand bags, wooden toys, framed art, baby blankets and quilts, one of which will be raffled off” Sarah mentioned. If you’re looking for quality, one-of-a-kind gifts this Christmas season, or you simply want to pamper yourself, the Lockwood and Hoff families encourage you to stop by and browse the many items that will be for sale at the fundraiser. In addition to getting a jump on the Christmas season, 100% of the proceeds will be used to help give a second chance to a child without a home. The boutique will be open on Saturday, November 25th from 9am to 5pm and on Sunday, November 26th from 10am to 4pm. More information and sample items can be found on the website at www.TheLockwoodHome.com/Boutique.